Whenever the restaurant serves these Stuffed Pork Chops, the customers gratefully clean their plates and say that such a meal reminds them of Thanksgiving or other holidays. 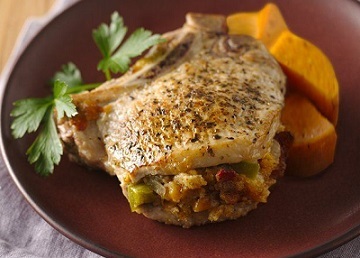 Why wait for such an occasion when this pork chop recipe is easy to prepare anytime? Using juicy, thick cut pork loin chops that are then stuffed with a sage cranberry dressing of cornbread (or bread crumbs), craisins (sun-dried cranberries), sage, chopped pecans (optional) and a little salt and pepper and you have a deliciously memorable meal. If there is a secret to this pork recipe, it's the combination of sage and craisins that help make up the stuffing. Each ingredient complements the other. They are a perfect match. 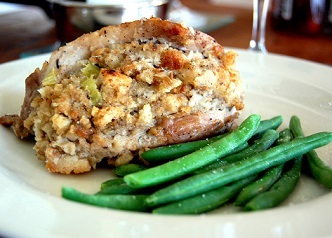 And this stuffing is also excellent with Roast Turkey or as a side with Roasted Pork Loin or Lemon Roasted Chicken. And, as an added bonus with this recipe, you can make delicious pan gravy from the drippings to top off your pork chops. This page tells you how. Serve these wonderful Stuffed Pork Loin Chops with Roasted Vegetables and rice pilaf for a perfect meal. 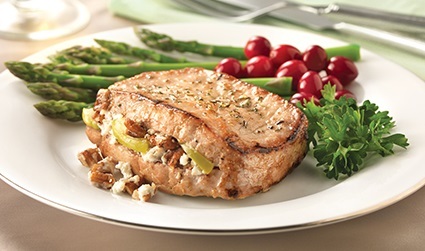 Enjoy your Stuffed Pork Chops and the company of those you share them with!